The information, software, products, and services included in or available through cinespot.net, sites/services may include inaccuracies or typographical errors. changes are periodically made to cinespot.net, sites/services and to the information therein. cinespot.net, and/or its respective suppliers may make improvements and/or changes in the cinespot.net, sites/services at any time. advice received via the cinespot.net, sites/services should not be relied upon for personal, medical, legal or financial decisions and you should consult an appropriate professional for specific advice tailored to your situation.cinespot.net and/or its respective suppliers make no representations about the suitability, reliability, availability, timeliness, lack of viruses or other harmful components and accuracy of the information, software, products, services and related graphics contained within cinespot.net sites/services for any purpose. all such information, software, products, services and related graphics are provided "as is" without warranty of any kind. cinespot.net, and/or its respective suppliers hereby disclaim all warranties and conditions with regard to this information, software, products, services and related graphics, including all implied warranties and conditions of merchantability, fitness for a particular purpose, workmanlike effort, title and non-infringement. This site may contain links to other web sites operated by third parties ("linked sites"). You acknowledge that, when you click on a link to visit a linked site, a frame may appear that contains the cinespot.net logo, advertisements and/or other content selected by cinespot.net.. You acknowledge that cinespot.net and its sponsors neither endorse nor are affiliated with the linked site and are not responsible for any content of any linked site or any link contained in a link site, or any changes or updates to such sites. 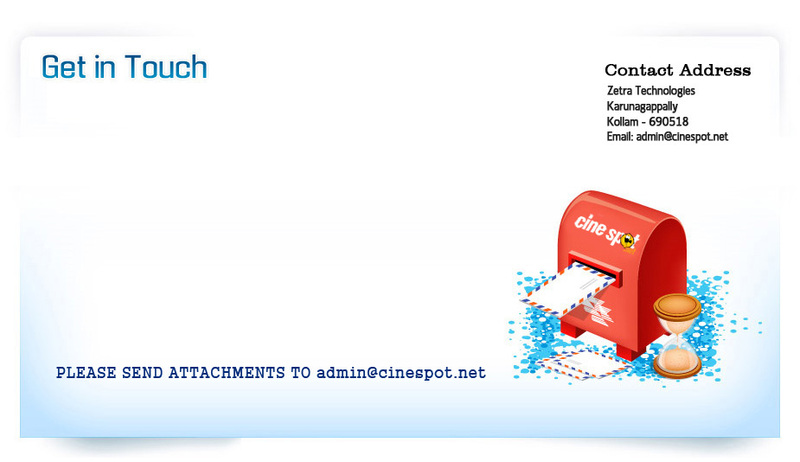 You also acknowledge that cinespot.net is providing these links to you only as a convenience. You specifically agree that cinespot.net shall not be responsible for unauthorized access to or alteration of your transmissions or data, any material or data sent or received or not sent or received, or any transactions entered into through cinespot.net site/service. You specifically agree that cinespot.net is not responsible or liable for any threatening, defamatory, obscene, offensive or illegal content or conduct of any other party or any infringement of another's rights, including intellectual property rights. You specifically agree that cinespot.net is not responsible for any content sent using and/or included in an cinespot.net sites/service by any third party. In no event shall cinespot.net and/or its suppliers be liable for any direct, indirect, punitive, incidental, special, consequential damages or any damages whatsoever including, without limitation, damages for loss of use, data or profits, arising out of or in any way connected with the use or performance of the cinespot.net sites/services, with the delay or inability to use the cinespot.net sites/services or related services, the provision of or failure to provide services, or for any information, software, products, services and graphics obtained through the cinespot.net sites/services, or otherwise arising out of the use of the cinespot.net sites/services, whether based on contract, tort, negligence, strict liability or otherwise, even if cinespot.net or any of its suppliers has been advised of the possibility of damages. cinespot.net does not endorse in anyway any advertisers/ contents of advertisers on its webpages. please therefore verify the veracity of all information on your own before undertaking reliance and actioning thereupon. cinespot.net shall not be responsible nor liable for any consequential damages arising on account of your relying on the contents of the advertisement. All the pictures on this web-site cinespot.net are assumed to be taken from public domain unless otherwise mentioned. The copyright (if any) of these pictures belongs to their orginal publisher / photographer / copyright holder as the case may be.